Well we're off! It's really against all my Mommy instincts to wake up Munchkin Girl at 5:30am and pull her out of bed, but that's exactly what I did. And she was thrilled! All went well until the plane took off. She was cuddling her baby when the head suddenly fell off. She started SCREAMING! I don't blame her. I imagine it's scary when your treasured dollie is decaptitated. The problem was that it rolled to the lady behind us and she wasn't too keen on getting it for her, especially since there was turbulence and she had to reach down and feel around and try to find the doll head. In the meantime, Munchkin Girl couldn't stop crying and wouldn't listen to reason at all. I tried to assure her that it was fine, but she was seriously terrified. The lady finally sucked it up and bent over and found the doll and that crisis was over. Changing planes went fine and thank goodness for portable DVD players! The travel after that was great with Munchkin Girl, but my parents are with us since we're visiting my brother and they sometimes they remind me a lot of the Seinfelds. Our bags were coming off at baggage claim and my Mom pulled her bag down. The handle wouldn't come up and she started panicking. And I mean panicking. "My bag is broken. It's broken! It won't work." She was yanking it with all her strength, over and over again and sure enough, nothing was happening. I'm not sure why it was a reason to panic, but she's my Mom. I help her, that's what I do. I quickly realized that the levers were both down so the handle was simply locked in place. She doesn't travel much, but still. Mrs. Seinfeld needs to calm down. 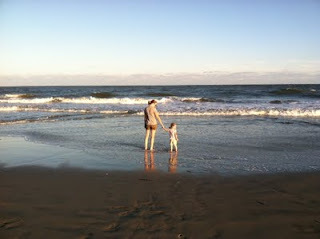 We did get to see the beach after we arrived and Munchkin Girl loved every second. 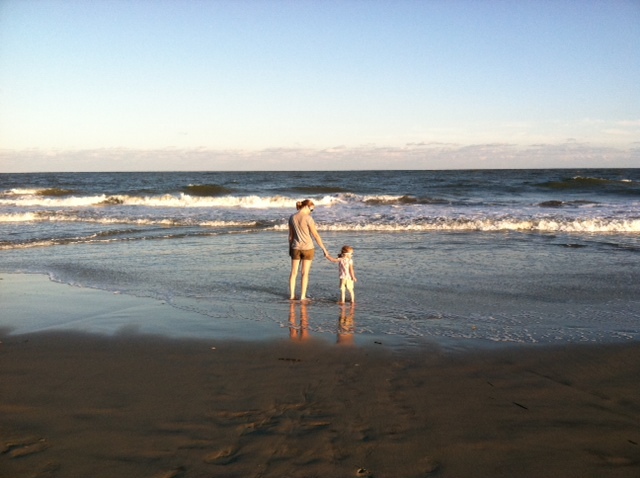 She collected shells, ran out into the surf and giggled, and even buried her legs in the sand. We found a bunch of shells in one place. 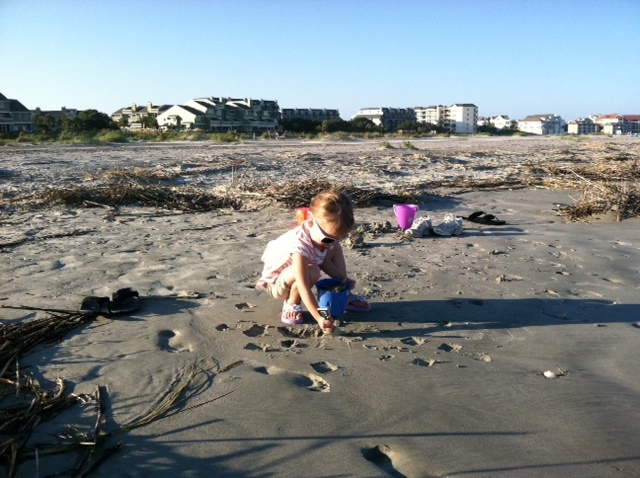 Munchkin Girl laughed and kept collecing an entire bucket-full of shells. Later, my Dad came over and said, "Watcha got there? What are you collecting?" "We're looking for Jackpots Papa! Here's a Jackpot for you!" she replied and handed him a seashell. Then, when I was putting her to bed and we were gathering up all her stuff, she said, "Mommy, let's not take Lucy to bed. Her head might fall off." Smart kid. It's going to be a fun weekend.